THE SIGNING OF A WIDE-RANGING DATA PRIVACY LAW in California should serve as a signal to all businesses that collect personal information about state residents to review and update their data collection, storage, and disclosure practices. The California Consumer Privacy Act of 2018 (CCPA), signed into law by Governor Edmund G. Brown on June 28, gives consumers greater control over how businesses can use their personal information. Governor Brown signed the bill a week after its introduction and just hours after its unanimous approval by the State Assembly and Senate. The new law was fast-tracked by the legislature in return for a pledge by consumer advocates to abandon their campaign to place an initiative bearing the same name on the November 2018 ballot. Under the new law, which takes effect on January 1, 2020, consumers will have the right to request that businesses disclose how their personal information is used and to ask that personal information be deleted under some circumstances. In its preamble, the CCPA cites the recent Cambridge Analytica incident—in which the personal data of millions of Facebook users was compromised—as an impetus for the legislation. “In March 2018, it came to light that tens of millions of people had their personal data misused by a data mining firm called Cambridge Analytica,” the preamble states. “A series of congressional hearings highlighted that our personal information may be vulnerable to misuse when shared on the Internet. As a result, our desire for privacy controls and transparency in data practices is heightened.” The preamble goes on to say, “Therefore, it is the intent of the Legislature to further Californians’ right to privacy by giving consumers an effective way to control their personal information, by ensuring the following rights:"
Businesses must make available two methods for consumers to submit requests, including a toll-free number and, if the business has a website, a website address. Requests for information must be fulfilled at no cost to the consumer within 45 days in most cases. Businesses that operate websites must include a clear and conspicuous link titled “Do Not Sell My Personal Information” that takes consumers to a web page where they can opt out of the sale of personal information. Businesses must ensure that all individuals charged with handling consumer inquiries are informed of the statute’s requirements and know how to direct consumers to exercise their rights under the statute. Enforcement of the statute lies largely with the Attorney General, but provides for a private cause of action in cases of unauthorized access, theft, or disclosure of a consumer’s nonencrypted or nonredacted personal information. Consumers must first notify the business of the alleged violation in writing and give the business an opportunity to correct it. In addition, a consumer seeking damages must notify the Attorney General before filing suit. Statutory damages available in a consumer’s civil suit are limited to the greater of between $100 and $750 per consumer per incident and actual damages. For violations other than those subject to a private cause of action, the Attorney General may seek $2,500 per violation for negligent violations and $7,500 for intentional violations. Brennan also noted the timing of the statute’s enactment, just weeks after the effective date of the European Union’s General Data Protection Regulation (GDPR) (EU) 2016/679, which strengthened and extended the reach of EU Data Protection Directive 95/46/EC. Although both regulations are designed to protect consumers by granting greater control over personal data, Brennan has the following advice for companies: “The new portability, access, and deletion rights, among others, are different enough from the GDPR that companies will need to take a fresh look at their operational compliance processes. Many companies are under the wrong assumption that GDPR compliance is sufficient, and unfortunately a number of systems that were launched by May 25 will no longer be sufficient,” Brennan said. Businesses affected by the statute should examine their data privacy procedures and policies over the 18 months leading up to the statute’s effective date. Companies impacted by the statute must consider compliance obligations and evaluate arrangements with partners, customers, and suppliers related to consumer data collection practices. While preparing to meet the compliance responsibilities related to the CCPA, businesses should consider the possibility that other states may adopt similar data protection regulations, which could expand protections to additional jurisdictions. Businesses required to comply with the CCPA should monitor, or potentially participate in, the Attorney General’s regulation adoption process to ensure compliance with the statute’s requirements. 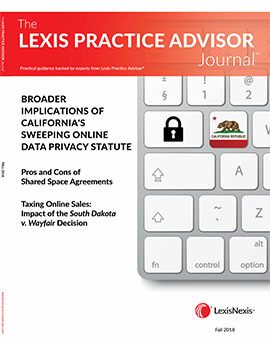 This article was written by the Lexis Practice Advisor Attorney Team with analysis included by Mark W. Brennan, Hogan Lovells US LLP and Elizabeth A. Rogers, Michael Best & Friedrich LLP. A partner in Hogan Lovells’ Washington, D.C. office, Mark Brennan leads an integrated technology practice that spans privacy, communications, and consumer protection issues. He advises on connected devices, artificial intelligence, cloud offerings, tech policy, and other cutting-edge challenges and is also well-known for his victories on Telephone Consumer Protection Act issues. Mark also leads Hogan Lovells’ U.S. LGBT+ affinity group and is a chair of the firm’s Pride+ global ally network. Elizabeth A. Rogers is a partner with Michael Best & Friedrich LLP. She focuses her practice on issues including breach responses, privacy risk assessments, and enterprise-wide cybersecurity compliance frameworks across industries such as retail, health care, financial services, energy and retail electric providers, education, and state and local governments. A former chief privacy officer in Texas state government, she brings a unique and informed perspective to her practice.